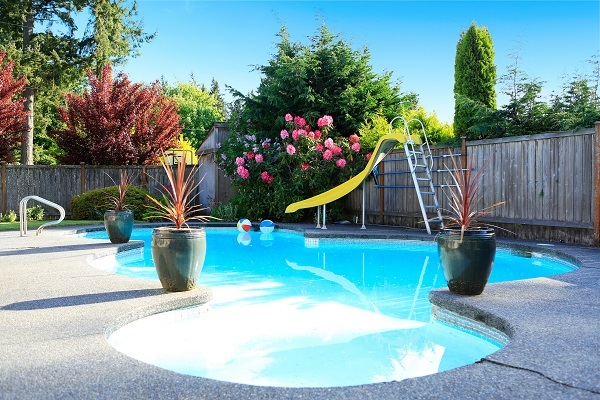 Swimming pools are great places to cool off and have social gatherings in the hot summer months. Most people believe that inground pool installation is a luxury reserved for large gardens with wide open spaces. That is not the case! We, at Mr. Pool, have compiled a list of some of the best designs for your inground swimming pool installation in your small backyard. A plunge pool is a small, deep pool for soaking and relaxing. Its volume comes from its depth and not its width, making it a ‘full body soaker’ in a much smaller space. It is extremely refreshing in those sweltering summer months. This design reduces the cost of the inground pool installation. Their volume and smaller diameter require less labor and materials. Heating and maintaining the water is faster and cheaper. If you have a long and narrow stretch of land on which to build a pool, a lap pool could be the answer you are looking for. Lap pools are swimmable pools that can be built up against walls or on the fence line. If your garden size is limited due to a hill or a slope, an infinity pool is a good choice. An infinity pool actually uses the slope to your advantage, as its design gives the illusion that the pool is larger than it truly is. Even with a small backyard, it is possible for you to have an infinity pool. You just need a professional pool builder to design your pool. Most small backyards aren’t square or rectangular. If this is the case, Mr. Pool will be happy to design an inground swimming pool that follows the shape of your garden, allowing you to maximize the amount of pool space. In addition to the design, Mr. Pool will also be able to do the inground pool installation. Hidden pool technology allows you to maximize your space in your backyard by creating a swimming pool that disappears when it is not in use. If your most pressing concern is ‘how much does an inground pool cost?”, then this project may ruffle your feathers. Hidden pools are not cheap. However, the efficient and versatile use of space that it allows, makes it worthwhile; not to mention the wow-factor! With 30 years of experience in pool services, Mr. Pool is your go-to company for inground pool installation. At Mr. Pool we pride ourselves on honesty, trustworthiness, and impeccable service. We have a variety of pool types at your disposal, or you can contact us for more information.